Since the release of iOS 12 Developer/Public Beta (i.e. a sample of the next version of Apple’s mobile operating system for iPhone and iPad), many iOS app developers and users are willing to try the iOS 12 features but don’t know how to get it. Would you like to try out the new features of iOS 12 public beta but don’t know how to get it? Then the following tips will be of great value to you as they bring to light how you can get the iOS 12 developer/public beta in a few minutes. The following sections of this post will teach us how to get the iOS 12 developer or public beta, and how to get the public beta on iTunes. June 4th saw the release of iOS 12 developer beta when Apple unveiled it at WWDC, and the later version can on the 19th day of June. Since then, Apple has been trying to get iOS app developers to try out iOS 12 beta versions before it’s released to the general public later this year. Here is how to get your hands on the iOS 12 developers’ beta version, but you ought to register as an Apple developer, and this costs $99. Step 1. Login to Apple’s developer site to enroll as a developer using your Apple ID. Step 2. Sign into iOS Developer Center, and register your Apple device’s UDID. Step 3. Download the iOS 12 developer beta (this file will be in IPSW format), and unzip the file on your PC or Mac while connecting to iTunes. Step 4. Hold down your Shift key (on PC) or Alt key (on Mac) and click “Summary > Check for Update” on iTunes. Select the IPSW file you just downloaded and iOS 12 developer beta will be installed on your PC/Mac. Step 1. Go to the Apple Beta Page, and click Sign Up. Step 2. Log in to the Beta Software Program, and click “Enroll your iOS device”. Step 3. Open your Safari app and search for “beta.apple.com/profile. Step 4. Download and install the configuration profiles. Step 5. You can check the Settings app to see the beta version under General > Software Update. When you get to “Step 5” on how to get iOS 12 public beta, you’ve downloaded the beta profile, but you still need to install it. Here is how to install the iOS 12 beta on iPhone or iPad. Step 1. Launch the Settings app and go to “General > Software Update > Download and Install”. Step 2. Enter your passcode and click “Agree” to Terms and Conditions. Click on Agree again to confirm. Your iPhone or iPad will install iOS 12, and reboot at the end of the installation process. Step 3. Tap “Continue” and enter your Apple ID password. Tap on “Get Started” to complete the process. If you’re planning on getting the beta version of iOS 12, then you need to, first of all, make a backup of your iOS information and data. It’s most advisable to back up your iPhone or iPad using a backup tool popularly known as iMyFone TunesMate. iMyFone TunesMate will freely transfer your iOS files to your computer to ensure that you don’t lose your files when you download and install iOS 12 public beta on your iPhone or iPad. Therefore, iMyFone TunesMate would make your iOS 12 public beta experience seamless. Syncs iTunes library to iOS without overwriting the previous backups. Rebuild corrupt or damaged iTunes library just in one click. 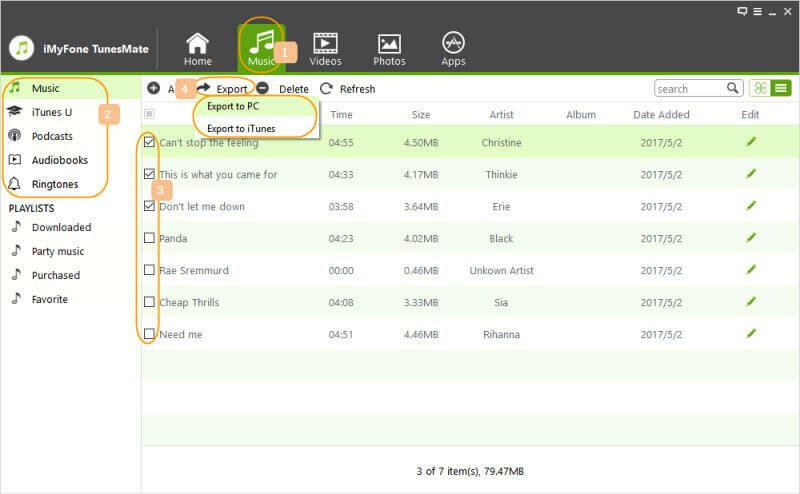 Copy or transfer the song to any iOS device or PC and send it another iOS device or PC without restrictions. Support all kinds of iOS media files. Step 1. Connect your iPhone/iPad to the computer where you downloaded and installed TunesMate. Connect your iPhone to your PC using a cable. Step 2. Export iDevice music to the computer by clicking the “Music” icon, and then click (Export > Export to PC). Select the folder where you would like to save the backup. Click “OK” to begin. Step 3. When you see a window Saying “Export Successful”, click OK to close the Window.